What is a print-on-demand company’s favorite month? To celebrate Socktober, we’re on social now! Follow us on Twitter, LinkedIn, and Facebook so we can follow you back. We’d love to get to know you and your business better. Don’t forget to let us know that you found us from this newsletter! These are brand-new accounts that we’ll be using to provide updates on new features and announcements, product info, and maybe even some cool new updates in the new year. 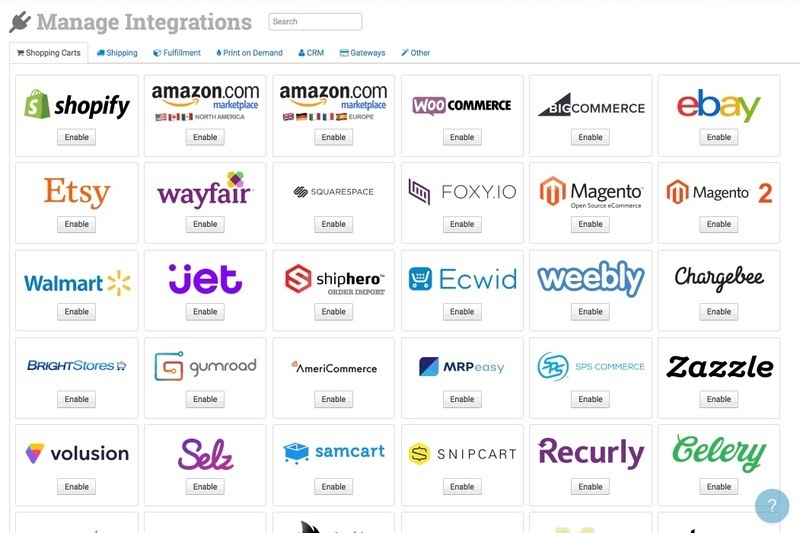 We’ve got so many integrations now sometimes we can’t even find the one we’re looking for, so this happened: a long overdue integration search tool! See it up there at the top? Look what happens when you type! Did you notice Shopify’s been making some fulfillment and inventory updates? 😅We’ve been doing our best to keep up and have been improving our fulfillment submission process to make sure your store is still running smoothly. Don’t you hate it when FBA won’t accept an order because it has an unsupported shipping method? Well, good news if you’re using FBA EU! If we run into this failure, we will auto-downgrade the shipping method and attempt to resubmit the order for you. We’ve added phone number support to the submitted details for your MWW orders. We’ve got your back—we’ll now send a note when shipments can’t be posted to Etsy. Now we can convert PDFs to JPGs for Jondo on the fly when we send your orders. Piece of cake! Need this for your store? Let us know. Zift now has improved shipping method support, and we also added brand support during asset upload. The PhotoUSA integration now includes UPS Mail Innovations as an option. You can now add the TextualProductID to your items when using the Custom Gateway integration. Have more control over your Wayfair order downloads with import date cutoffs. Phew. We’ve also increased clarity on the wording we use when we set Wayfair shipping methods. Plus we’ve also started automatically setting the Wayfair shipping account numbers on your orders. Want to change your Amazon Marketplace product fulfillment method or the days to fulfillment settings? Now it’s possible. Adding your third party shipping accounts to Circle Graphics just got WAY easier. Now you can set the full shipping account number Circle Graphics requires in the integration settings and just add the shipping account number itself directly to the order. We’ll do the rest. If you’ve had to deal with this before, this will be a huge help. Read more about it here. Same day option is now available with Shipwire. Learn more here. Is it Gray? Grey? Heather? Foggy? What is that color anyway? Clear up any color confusion with the new color conversion feature available for all print-on-demand integrations. Read more about how to do this here. Want us to send your shipment details somewhere specific? Set a url in ship_notify_url in the order metadata for a built-in webhook, and we’ll send the details there for you when the order gets shipped. We’ve been hearing from you about this one for awhile, so we’re happy to finally announce that if you use product code match or code replace, we’ll do a much better job of splitting the cost and weight proportionally, and we’ll even combine multiple line items where possible. If you had the auto-decrement inventory feature turned on, you may have noticed your inventory was deducted twice when splitting orders. Yeah. That’s not going to happen anymore. We’ll now append a 0 to the four digit zip codes in CT, MA, ME, NH, NJ, PR, RI, VT in case your zip codes got truncated by an Excel export. Added alternate print URLs for some print-on-demand services so you can be specific about which templates you send where. If you need this, let us know. We made a little precautionary internal tweak so DST time changes won’t mess up when orders are downloaded. We’re not sure why you’d want to remove your item variations ¯\_(ツ)_/¯, but if you really want to, go for it with the new Delete Order Item Variations rule action! We’ll automatically create a tracking URL if you add an S.F. Express shipment to your order. If there’s anything you think we missed, or something you’d like to see in the November update, feel free to hit us up on social!